For those who don’t know, IBS is short for Irritable bowel syndrome, super glamorous I know. It manifests in different ways, some people are more prone to constipation, others to diarrhea. IBS is something I have struggled with most of my life and this may be TMI, but I fall into the diarrhea end of that spectrum and that’s what I will discuss here. Over the years I have tried EVERY diet under the sun in an attempt to manage this, but nothing has helped me avoid flares entirely. After six years where I mistakenly believed I had Celiac Disease (long story involving a lack of health insurance and not getting ALL of the required tests) I finally went back to a new doctor and he told me it was IBS and that 1 in 5 women struggle with it. That’s 20% of us, which means it’s pretty common. When I started hiking and backpacking more often my IBS was a major source of anxiety for me. Especially after I had a couple of incidents on trail. I am definitely someone who likes to feel in control of things, but the outdoors and IBS have both taught me that I am never fully in control. Luckily, after a few years of dealing with this it’s gotten a lot easier for me! Here are some tips and tricks I have picked up a long the way, please keep in mind I am NOT a doctor, this just how I have managed my IBS on the trail. Know what triggers your IBS. Spicy food, high fat foods, and coffee are all triggers for me. Especially if I have a lot of them all at once. Unfortunately, spicy food and coffee happen to be my favorite things. When I first started backpacking I would shoot down Taco Bell hot sauce packets and Starbucks Instant coffee like they were going out of style. It only took me a couple of trips to realize this was a TERRIBLE idea. Now I limit my hot sauce consumption, and mix up coffee with other caffeinated beverages in the mornings. This keeps my body a lot happier and helps me avoid multiple late night trips to the bathroom (aka a hole I dug in the ground). Test all food before a big trip. Never had a dehydrated meal before? The first night on the trail might not be the best time to test it out if you suffer with IBS. On my Chelan Lakeshore trip, Sarina brought a Backpackers Pantry Kung Pao Chicken dinner for us to share. I thought nothing of the fact I had never tried this meal before and was up most of the night attempting to not stink up our tent. At one point Sarina asked me if our friends baby had pooped and I had to admit to the issues I was having. Now I test all backpacking meals at home before my trips to make sure they sit well. 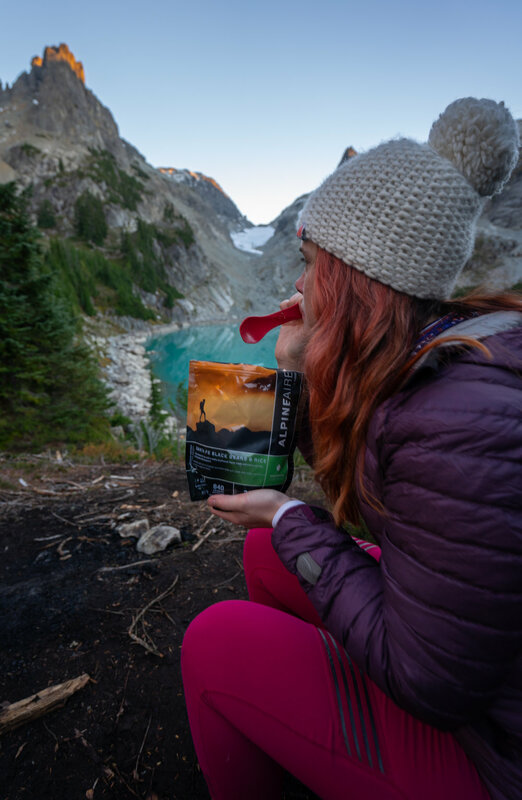 Backpacking food that nourishes you, and keeps your stomach from exploding = a win-win. Supplement your first aid kit. I bought a preassembled first aid kit for hiking and added Imodium, probiotics, and chewable Pepto tablets to it. If I recognize my stomach is unhappy early on, one Imodium tablet can help me avoid issues. Probiotics keep my stomach happier and healthier in general. Pepto is often my last resort as it can make my stomach hurt even more but it keeps me from needing to dig anymore holes in the ground. When you find whatever medicine or supplement that works for you, make sure you always have it with you on the trail. Research the bathroom situation on the trail or at the campground. 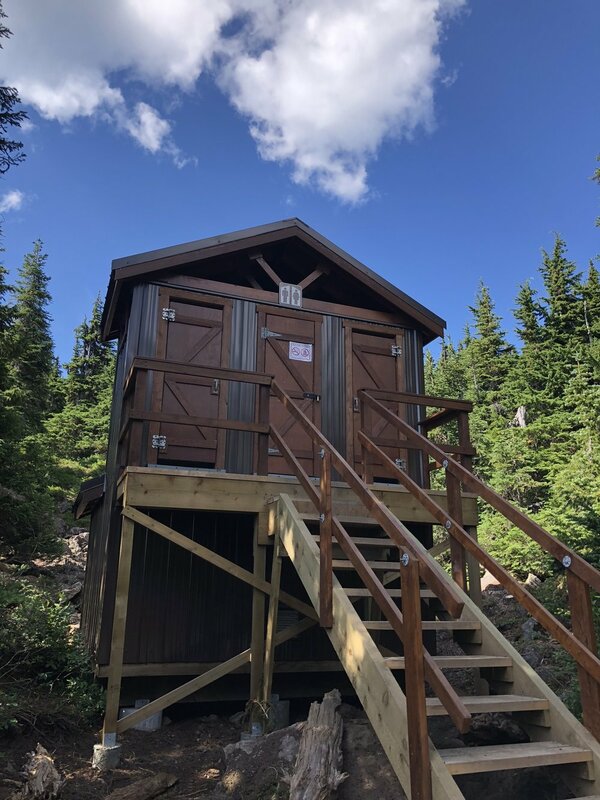 The most glamorous toilets I have seen on a backpacking trip. Photo by Doris at Garibaldi Lake. Leave No Trace (even after the fact). Sorry friends, IBS doesn’t mean you are exempt from Leave No Trace principles. 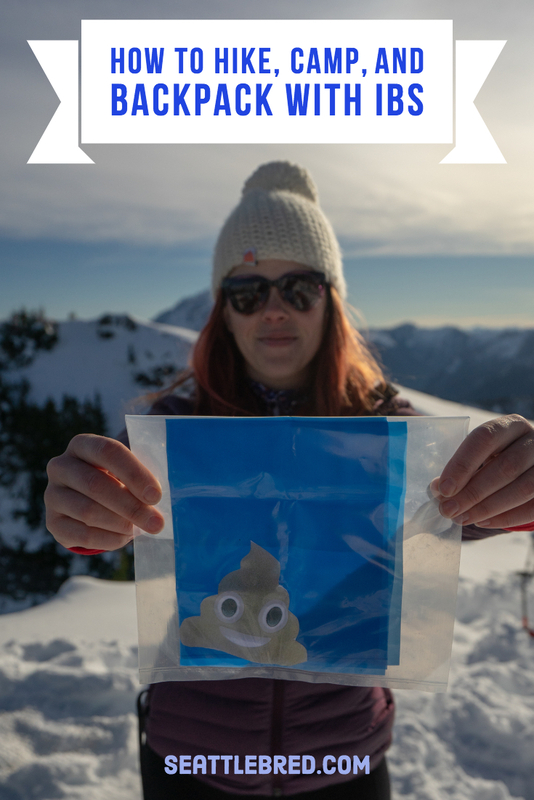 No one wants to see a pile of your poop on the trail. I understand that sometimes it’s an EMERGENCY, and it’s all you can do to make it a few feet away from the trail. Carry a trowel, toilet paper, and a blue bag on every hike or backpacking trip you go on. If you have an issue and need to go before you can dig a proper cathole, dig one afterwards and use sticks to push your waste into it. Poo’d where you can’t dig a hole? That’s why I carry scented biodegradable dog waste bags for! Bag it up as you would your dogs waste. Then I triple bag it so it will be as safe as possible in my pack when I pack it out. Not ideal, but better than leaving a pile of your poo for other hikers to discover. 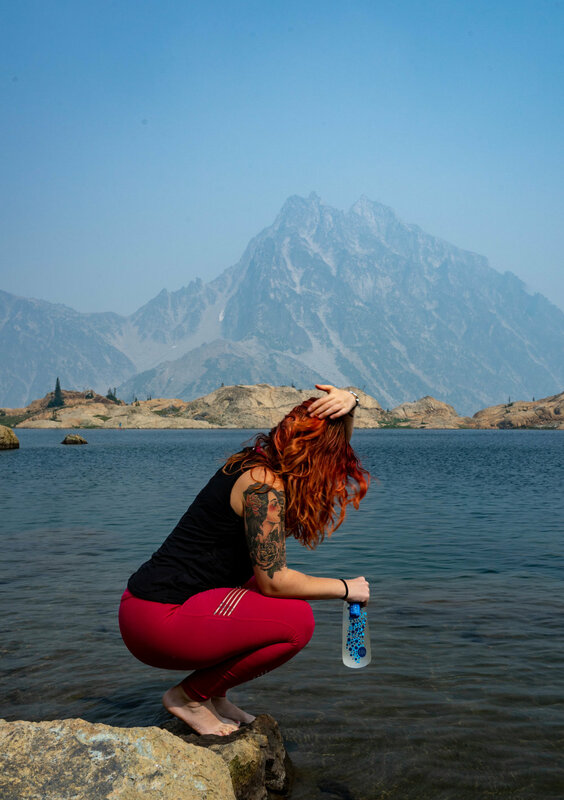 It’s already important to stay hydrated when you are hiking, but if you have an IBS flare your risk of dehydration gets even worse. Make sure you research the water status on the trail. Will you be able to filter more? If not make sure to pack extra water in case the worst happens. I also bring along Nuun tablets on all of my hikes to replenish my electrolytes regardless of how my stomach is feeling. I always bring my water filter if I know there will be a water source! Wet wipes and hand sanitizer are your best friend. It’s already hard to feel clean while backpacking, add an IBS flare and it’s even worse. I always pack extra wet wipes for this reason and use them after every poo on the trail. If you want to pack them out discreetly, turn a ziplock bag inside out and cover it in duct tape. Turn it back right-side out and boom you have a discreet soiled wet wipe carrying contraption. Personally, I don’t really care and throw them into a double bagged ziplock as is, or into a blue bag with my waste if I am using that. Hand sanitizer is self explanatory, never be caught pooing in the woods without it. I have a travel bottle squirreled away in every one of my packs so I never forget to transfer it from one pack to the other. I get embarrassed when I have a flare on the trail. I don’t want to admit to anyone that I am struggling, including myself. I keep plodding along, dehydrated/feeling awful and won’t ask for help or rest. In the end this serves no one, because at some point I break down and am forced to rest longer. There are some trips I honestly probably shouldn’t have even gone on since I was so miserable. When you live with this on the daily, it’s easy to fall into a trap of thinking that you should be used to it and be tougher, but that’s not the case. It’s a medical condition and you need to listen to your body, which sometimes means slowing down, or even turning around if needed. How do you manage your IBS on trail? Any tips I missed here?